Last edited by archibalduk on Mon May 10, 2010 9:03 pm, edited 1 time in total. 4.1 For the purposes of the rules, each season begins on 1 July and ends the following 30 June. 4.2 In relation to your Challenge team, you must at all times be the only one in charge of player movement, team management and tactics. This means you cannot ever set your challenge team to go on 'vacation'. You must coach all games. You are not allowed to sim through the games with the Head Coach controlling them. This rule does not apply to your affiliate teams, however. 4.3 You are not allowed to be GM of a National Team during a Challenge. 5.1 Season 1 starts as soon as you start the game and finishes on 30 June. Season 2 begins on 1 July of the following year. 5.2 No trades, waiver acquisitions or UFA acquisitions may be signed whatsoever during Season 1. You may, however, renew contracts with your own players and staff at any time. 5.3 You may sign your unsigned prospects (prospects who have never previously been contracted to your challenge team) at any point after starting the game until 1 October (inclusive). Further, you may also sign your unsigned prospects from 1 May until the following 1 October. 5.4 You may place players on the waivers at any time. 5.5 You may only buy-out or release your own players’ contracts during the month of June if they earn over US$1,000,000. If the player earns US$1,000,000 or less, you may buy-out their contract at any time throughout the year. 6.1 Note: each season begins on 1 July so any trades completed after 30 June count towards the new season’s quota. 15 July - 15 October (both dates are inclusive). If a trade is not confirmed, and the traded for player is not on your roster by July 14th, the trade cannot be completed. Further, we know it takes a few days to make a trade in most cases, so there should not be any confirmed trades on October 16th in your game. 6.3 You may sign your unsigned prospects (prospects who have never previously been contracted to your challenge team) from 1 May until 1 October (inclusive). 6.4 You may place players on the waivers at any time. 6.5 If a player contracted to your Challenge team becomes an RFA, you may re-sign him during the period of 1 June until 1 October (inclusive). This does not count towards your UFA quota. 6.6 You may only buy-out or release your own players’ contracts during the month of June if they earn over US$1,000,000. If the player earns US$1,000,000 or less, you may buy-out their contract at any time throughout the year. 6.7 No trades of any kind are permitted on draft day. 6.8 Trade deadline day trades are acceptable. 6.9 You may not trade in or out any draft picks or unsigned prospects at any time (except if you make a trade in compliance with Rule 6.11 below). 6.10 You may not trade out any player less than least twelve months (i.e. one year) after you signed/acquired him. This does not include players who were originally on your roster when you first started the game. 6.11 You may now make a maximum of two trades per season. One straight up 1-for-1 deal is allowed. You may send one player out and you may accept one player in return. Nothing more. One player for pick or pick for player deal is allowed. In an effort to rebuild through the draft, you may trade an older player (aged 33 or older) for a draft pick (no better than a 2nd round pick). Alternatively, to strengthen your team through veteran talent, you may trade a draft pick (no better than a 2nd round pick) for a veteran player (aged 30 or older). You may only do one of these deals involving a pick each season. 6.12 Proof of trades being made during appropriate times may be required. In your player history there is a "transactions" news item, showing the date he was acquired by your team. This may be requested on occasion. 7.1 You may not sign any RFAs whose rights are held by another team. 7.2 UFAs may only be signed between 1 July and 31 August, inclusive. If the player is from Europe and will not transfer during the UFA signing period, take a screenshot of the news item where they accept the contract. Keep this screenshot on your computer (no need to post it) in case the signing is called into question. 7.3 North American born or based players must be at least 24 years of age at the time of signing to qualify as a UFA signing. 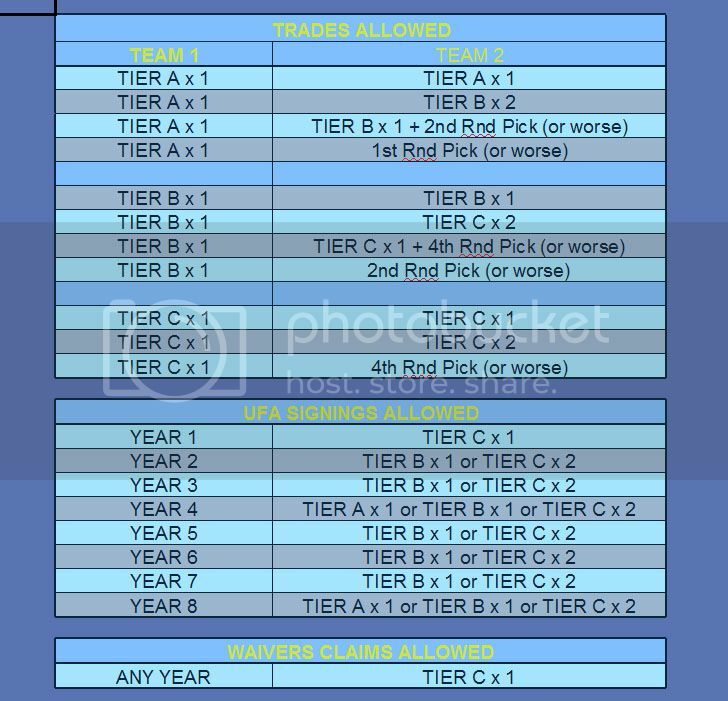 7.5 Instead choosing one of the UFA signing tiers, you may sign one player from waivers at any point during the year and without restriction as to annual salary. If you take this approach, you will not be able to sign any UFAs during that season. 8.1 You must have 3 goalies under contract during the regular season. 9.1 You may hire as many non-playing staff as you choose. 10.1 If you are fired as GM and you are 5% over (or greater) the budget set by your board, your participation in the Challenge ceases. You may not add yourself again to the game and you may not restart the Challenge. 10.2 If you are fired and you are less than 5% over the budget (or you are any amount under the budget) set by your board, you may re-add yourself as GM. You must provide a screenshot on the day you are fired to prove that you were under budget. Last edited by bruins72 on Thu Dec 23, 2010 3:46 pm, edited 2 times in total. 5.1 Season 1 starts as soon as you start the game and finishes on 30 June 2007. Season 2 begins on 1 July 2007. 5.3 If a player contracted to your Challenge team becomes an RFA, you may re-sign him at any point after starting the game until 1 October (inclusive). This does not count towards your UFA quota. 5.4 You may sign your unsigned prospects (prospects who have never previously been contracted to your challenge team) at any point after starting the game until 1 October (inclusive). Further, you may also sign your unsigned prospects from 1 May until the following 1 October. 5.5 You may place players on the waivers at any time. 5.6 You may release players at any time. 6.6 You may release players at any time. 6.9 You may not trade in or out any draft picks or unsigned prospects at any time. 6.11 You may make a maximum of one trade per season. This trade may including one player on each side. Only straight up 1 for 1 deals are allowed! 7.1 No UFA signings are allowed! You may only sign players whose right you own. 8.1 You must have at least 3 goalies under contract at all times during the challenge. Two of those goalies should be assigned to your challenge team and the other one should be assigned to you "farm" (development) team. 8.2 If one of your goalies on your challenge team is injured, you should call up the goalie from your "farm" team. 8.3 If you have only one healthy goalie under contract remaining, you may sign a "UFA" goalie to cover the roster spot. 8.4 When one of your injured goaltenders returns to 100% fitness, you must immediately release the goaltender you have signed as cover. 9.1 The restrictions in this section (i.e. section 9) do not apply to affiliate team staff. 9.2 You may fire no more than one assistant coach and two scouts per season. You may, however, sign as may assistant coaches and scouts per season as you wish. You may hire and fire as many other types of non-playing staff as you like (e.g. physios, assistant GMs, etc). 9.3 You may hire as many non-playing staff as you choose. 9.4 If you wish to sign another Head Coach, you must sign somebody who has been contracted to your team for at least the past six months. 9.5 If the challenge team has no head coach at the start of the game (i.e. the team has a GM/Head Coach who leaves when you take over the job), you may hire a head coach from outside the organization. This only applies to starting the game! Once the 1st regular season game is played, you are no longer allowed to directly hire a head coach from outside the organization. 9.6 Player/Coaches must adhere to the rules for signing both players and non-players. 10.1 If you are fired as GM you may re-add yourself as GM. Note: This only applies to NHL Challenges. This does not apply to Canadian Junior League Challenges. Each challenge team will be set up with a “core” roster of ten players for the first season of the challenge. This core will be chosen by challenge GM’s prior to the first regular season games of the first season of the challenge. 5.1.1 The core will be chosen from the team's roster that you begin the game with. Player Tiers will be listed in the Core Roster Rules spreadsheet. Group A: Elite players. These could be players with a lot of talent or large contracts. Group B: Mid tier players These could be players with 1st/2nd line talent and reasonable contracts, or 2nd/3rd liners with large contracts. Group C: Prospects/Depth players These could be players who are young prospects, or veteran depth players. 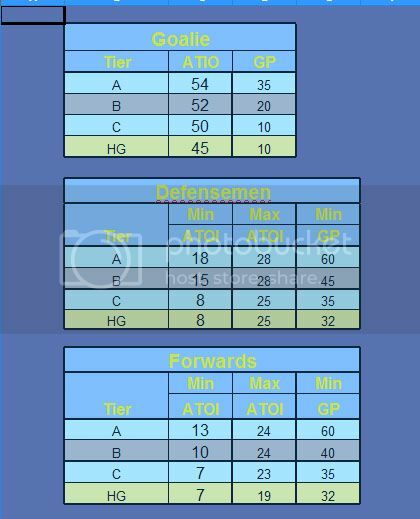 5.1.2 Each group of players will have an ATOI (Average Time On Ice) requirement and a minimum number of games played. 5.1.3 Whilst a player is a Core player, they cannot be traded. 5.1.4 The number of Core Roster Players you must maintain decreases each season. Note: This only applies to NHL Challenges. Section 5.2 and its subsections do not apply to Canadian Junior League Challenges. Starting with Season 2 the GM will be required to nominate a Homegrown player on his/her NHL roster each season/ This player will be a player in “your system”. be 24 years old or younger when at the beginning of his Homegrown season. 5.2.2 The Homegrown player is required to meet the Games Played and ATOI requirements for Homegrowns (HG) in what would be his rookie season. Provided the Homegrown reaches these goals he can be sent up and down between your minor league system and your NHL club. 5.2.3 Once the player has completed one season as the Homegrown player, he become part of your core roster. They will then proceed through to the appropriate Tier. Lookup the player's tier on the "Players' Tiers" tab of the Core Roster Rules spreadsheet. If the player isn't listed, please assign his Tier based upon where he was drafted on the tab labeled "New Player Tiers". You must keep them on your roster for at least 2 seasons after the season he is declared a Homegrown. In essence, you will have to keep this player for three seasons. Note: This only applies to NHL Challenges. Section 5.3 and its subsections do not apply to Canadian Junior League Challenges. Season 1 : Ten core players to be declared prior to first regular season game. Season 2 : The Homegrown joins your roster. You have eight core players (chosen from last season's ten core players) plus the HG. These nine players must be declared prior to your first regular season game and must meet the tier's play requirements. Season 3 : The Homegrown from season 2 stays on your for this season (and he must be kept for the entirety of the season). You have a seven core players (from season 2's eight), plus last season's Homegrown and your new Homegrown on your roster. These nine players who must be declared prior to your first regular season game and must meet the tier's play requirements. Season 4 : The Homegrowns from Year 2 and 3 stay on your roster for this season. You'll also have a new HG for this season and five core roster players (out of last season's seven). These eight players must be declared prior to your first regular season game and must meet the tier's play requirements. Note: This only applies to NHL Challenges. Section 5.4 and its subsections do not apply to Canadian Junior League Challenges. 5.4.2 Goalie development is much different than that of a player. The Goalie Minutes played are adjusted accordingly in the chart. 5.4.3 Games played requirements that are not met will need proof of injury and its duration. A screenshot of the news item announcing the player's injury in EHM is sufficient. Post the screenshot in the Core Roster thread. NHL: 15 July - 15 October. If a trade is not confirmed, and the traded for player is not on your roster by July 14th, the trade cannot be completed. Further, we know it takes a few days to make a trade in most cases, so there should not be any confirmed trades on October 15th in your game. 5.5.2 There will be no trades of any kind allowed on draft day, in any season. 5.5.3 Trade deadline day trades are acceptable. 5.5.4 You may only trade draft picks for the upcoming draft. 5.5.4.1 You may not trade your first round pick to move up in the draft. You must pick from where you finish in the season. 5.5.5 You may not acquire or use more than two draft picks per round of the draft. This includes your own pick. Therefore, you shouldn't have any more than two first round picks, two second round picks, etc. (Unless in the beginning of the game the team already has three picks for a round - this is allowed. It will become clear if this is the case when we play each team). 5.5.6 You may not trade out any player less than least twelve months (i.e. one year) after you signed/acquired him. This does not include players who were originally on your roster when you first started the game. 5.6.1 Unrestricted Free agents may only be signed between 1 July and 30 September, inclusive, starting with the first season of the challenge. Free agents may not be signed during the season (i.e. 1 October - 30 June). 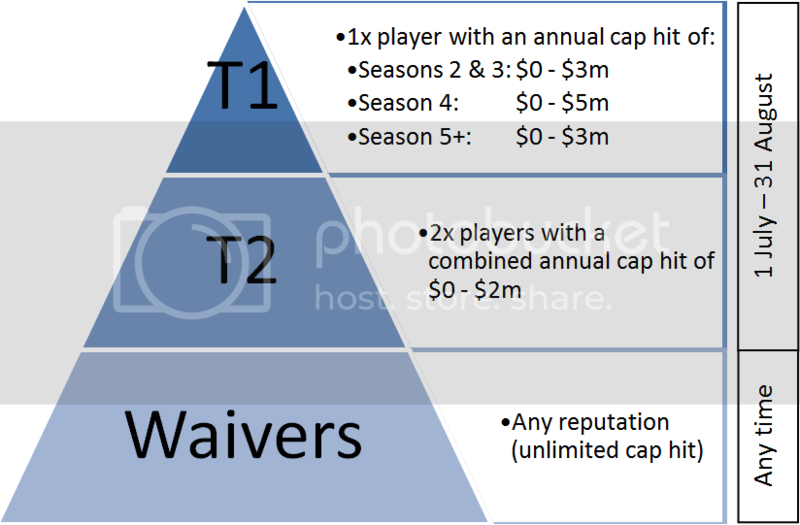 5.6.2 Tier C players may be claimed at any time, limit 1 per season. Download the Core Roster Rules spreadsheet! 6.1 The restrictions in this section (i.e. section 9) do not apply to affiliate team staff. 6.2 You may fire no more than two assistant coaches and four scouts per season. You may, however, sign as may assistant coaches and scouts per season as you wish. You may hire and fire as many other types of non-playing staff as you like (e.g. physios, assistant GMs, etc). 6.3 You may hire as many non-playing staff as you choose. 6.4 If you wish to sign another Head Coach, you must sign somebody who has been contracted to your team for at least the past six months. 6.5 Player/Coaches must adhere to the rules for signing both players and non-players. 7.1 If you are fired as GM and you are 5% over (or greater) the budget set by your board, your participation in the Challenge ceases. You may not add yourself again to the game and you may not restart the Challenge. 7.2 If you are fired and you are less than 5% over the budget (or you are any amount under the budget) set by your board, you may re-add yourself as GM. You must provide a screenshot on the day you are fired to prove that you were under budget. You must report your Core Roster and Homegrowns before the first regular season game each season!